When the fat woman fainted in the reception area, her round body spilling across the waxed parquet and toppling two surrounding chairs, everyone rushed over to aid in the rescue effort—-even the most bereft mourners were among them. Shoulder to shoulder, the ladies in black flocked around the downed woman, and clucked various suggestions in their eagerness to revive her. They ranged in absurdity from pinching her arms to pouring several vases of water over her lolled head. Arly, however, retained her post by the casket, relieved that fate had afforded her a badly needed diversion. Arly slid over to the pallid man, his eyebrows slightly raised as if awaiting the punch line to a dull joke. She reached toward his clasped hands and squeezed the contents of her fist in his shockingly warm palm, all the while keeping the squawking ladies in her periphery. Preoccupied as they were, the ladies never noticed that the morose florist, who bore a slight resemblance to the deceased, had paid her respects. Later she recounted the tale to a bartender who informed her that funeral homes routinely aimed spotlights at the hands of the dead in order to keep them warm, as mourners unfailingly reached for them. This put an end to her childlike amazement. As with every encounter she had with her father, she neglected to look him straight in the face, his image remaining a blur in her memory. She held no solid recollection of any features and often looked to pictures for reference. She always thought of him when, flipping through the channels, she happened to glimpse the blotted face of a perpetrator fleeing the scene of a crime on a cop show. Much like the criminals, her father had preferred to remain a shadowy figure in her life, and subconsciously she acquiesced by looking at him without really seeing. Arly had worked at the flower shop for only three days when she received the order for Domingo Martinez’s wake. Wreath orders streamed in throughout the day and several were to be delivered the next morning. Her supervisor, noticeably exhilarated yet frazzled by the sudden flood of orders, handed her a laminated script she was to follow while taking the phone orders. Each time the telephone rang, the wiry woman would run over with her elbows tucked in at her sides to ensure that Arly was being faithful to the sterile lines. “I shouldn’t even be allowing a new hire to answer the phones,” the woman lamented, even though Arly did not stray from the script. “Will that be all ma’am/sir? May I suggest a tasteful arrangement of gladiolas?" Arly forced a somber yet professional tone while fielding the Martinez calls, all the while fighting the urge to ask the caller a long list of invasive questions, inappropriate given her position. For the most part, she was able to keep her composure by denying that this particular Domingo Martinez was her father. After all, there were probably at least twenty Domingo Martinez’s in Hialeah alone, not to mention the whole of Miami. At one point, she confirmed this by sneaking a peek at the white pages—-the surname Martinez taking up more than five pages. It was when she received the fat woman’s call for a wreath that her suspicions were confirmed. All the prior calls she had written down on the pink and yellow order slips with an impersonal air. But her aunt’s lilting voice was unmistakable as she stifled evenly spaced sobs throughout the detailed, and predictably extravagant, order. Arly spent the remainder of the day in a fog. She lingered at the water-stained display window and studied the blooming thunderhead in the distance. Like her father, the unfolding cumulus was larger than life and deceptive: All those underfoot unable to predict when the eruption of rain and searing lightning would begin. While misting birds of paradise, Arly also measured her floral surroundings. The scent, however sweet, could not mask the smell of rotting wood panels whispering just beneath the clamor of pastoral perfume. And while she trimmed several pounds of baby’s breath for the Martinez wreaths, she considered how quickly the careful arrangements would melt into a stinky pile, all of the calculated contrast and complement curdling into an indistinguishable shade of wilt. She wondered how her father would feel about his upcoming submersion in a sea of painted carnations, then immediately regretted not being able to surmise his potential opinion. When it came to her own defense, Arly could not form words capable of defying the terrible boom escaping his throat, so she hid behind a curtain of her own hair and stared at her shoes. All this because she skipped fourth period to indulge in an extended lunch, and the school secretary had called the wrong emergency contact number. She couldn’t remember the look in his eyes that day, but remembered the smell of cigarettes and whisky that surrounded him in a gray aura. Years later, Arly concluded that his reaction to her small digression did not indicate that he wanted better for her, but that he had simply found his way out. Her behavior confirmed a defect he had suspected all along, a daughter that had not met quality standards and was destined to remain in the bin marked “discards.” Aside from knowing that he smoked Winston’s and insisted on Jack Daniels, she knew little else of Domingo Martinez, and therefore had no idea what he would think of the mass of flowers assembled in his honor. The wiry woman was dismayed by Arly’s distracted behavior, and sent her home an hour early. While she had no patience for employees who lacked focus, she informed Arly that all hands were on deck for the Martinez wake—-Arly would be delivering the arrangements and wreaths throughout the better part of the day. Arly nodded and let the glass door close behind her, the chimes attached to it clinking a half-hearted farewell. While Arly had pictured sneaking in to her father’s wake and touching his forehead with her fingertips—-the contact between their fleshes somehow ridding her of all her neatly packed and clearly labeled daddy baggage—-she had not thought for a moment that she would actually have to set foot in the building where her dead father lay. On her way home, she decided that she would just not show up for work the next morning. In only three days, she had not invested much time and energy in the flower shop and she could find another equally menial job within a week. The next morning she arrived at the shop fifteen minutes early. Arly did not fear being recognized at the wake. Most of his family lived out of state and had only seen baby pictures of Arly at best. Consumed by the idea of her father’s lifeless presence, she neglected to consider any mourners at all. She was surprised to see so many people, women mostly, weeping openly in the dimly lit salon. It dawned on her that she had assumed her father was incapable of forming any personal bonds, when he had only failed to bond with her. Arly felt guilty about being there at all, holding only spite and no license to mourn. Ashamed by her awkward position, she stood in the shadows, pretending to straighten the glitter-crusted sashes that hugged the wreaths. When the fat lady made her entrance and caused the commotion, Arly saw her chance finally to confront him. She knew there was little time, but found speaking out loud to the shell of her father farcical. She uncurled her fingers and reached towards his forehead, but could not commit to such an intimate gesture. Clenching her jaw, she discovered a tasteless pebble of gum that had been cowering behind her molars, and recalled a game she had played with her best friend in the fifth grade. Perpetual bubble gum chewers, Arly and Tara, who often argued and lacked the necessary skills for conflict resolution, had once decided that the only way to settle their arguments was to release all of their pent up anger into in their gum. Their theory was that gum, in all its sticky goodness, would cling to whatever bad feelings they harbored for each other. The idea was ridiculous, of course, and hardly fool proof—-their childish arguments often requiring four and sometimes five pieces of gum before they could come to an agreement. But the method forced the girls to resist nursing their wounds and bruises. Rather than cradle their hurts, they had to toss them out, leaving no time to find solace in the arms of self-pity. Although Arly had found considerable comfort as sufferer, she was now eager to escape its narrow confines. In a split-second decision, Arly spit the gum into her cupped hand and handed it off to her father. It was not the graceful, healing touch she had envisioned, but it would have to do. Janelle Garcia is a stay-at-home mother of two. She is passionate about reading and writing. However, she is often interrupted by her adorable and rather talkative children, leaving her with a pile of (did you say you wanted a glass of milk?) fragmented thoughts. But she wouldn't trade it for the world. 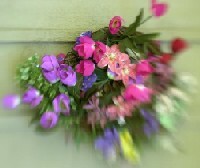 Photo of flowers courtesy of Nasir Kahn, Mequon, Wisconsin.